The Jamaica Observer covered the funeral of Skatalites drummer Lloyd Knibb, which took place on Sunday, May 29, 2011 in St. Andrew, Jamaica. During the reading of the eulogy Herbie Miller, director/curator of the Jamaica Music Museum, hailed Knibb as one “who can make a dancehall rock and roll like a church revival”. “He alone was doing what upwards of five drummers would be doing. There were great drummers around at the time, but Lloyd Knibb stood out... he was the innovator of rocksteady,” said Miller, who also described Knibb as a great blues dancehall musician. Miller credited Knibb as the one who “kept the Skatalites together for its short lifespan” as he spoke of his sense of humour, level-headedness and humility which all helped the other members of the group to see reason. “He was not just the greatest this country produced; he was the drummer of all drummers,” said Miller. Those paying their respects to Lloyd Knibb and his family included Samuel Clayton of the Mystic Revelation of Rastafari, Bongo Herman, Steven ‘Lenky’ Marsden, Sly Dunbar, Studio One Recording’s Edley Bennett, Frankie Campbell, and Grub Cooper. 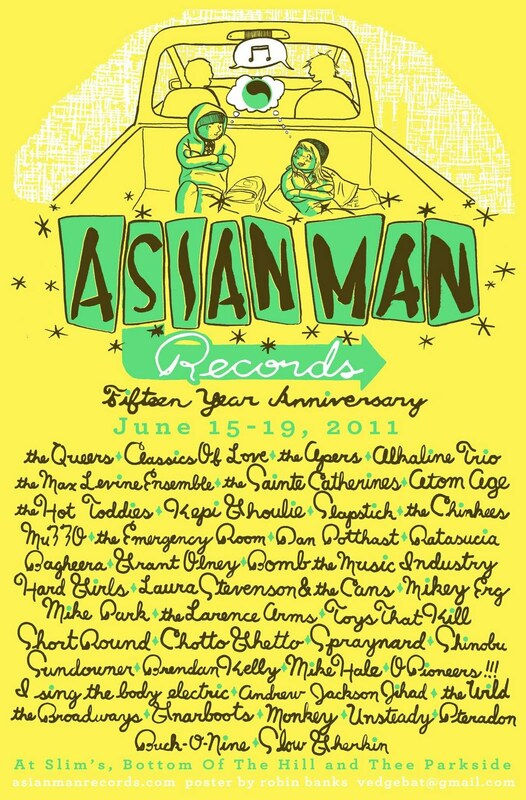 Asian Man Records' 15th Anniversary Festival! Mad respect to Mike Park for keeping his incredible DIY punk rock 'n' ska label--Asian Man Records--going all of these years! He's throwing a huge multi-day festival (June 15-19 at Slim's, Bottom of the Hill, and Thee Parkside in San Francisco) with over 40 acts (as well as a free BBQ on June 18th at Thee Parkside from 2:30-6:30 PM)--all of the event details can be found here. 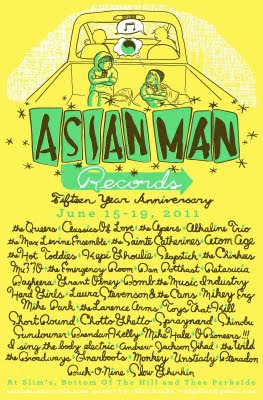 Ska and ska-punk bands featured at the Asian Man Records 15th Anniversary Festival include MU330, Monkey, Unsteady, Buck-o-Nine, Slow Gherkin, Slapstick, The Chinkees, Bomb the Music Industry, and more. Plus, there are a slew of punk bands if yer into that kind of thing! If you're anywhere near the Bay Area, this looks like a terrific way to spend a couple of days. Support live music--support the bands--support Asian Man Records! Duff Review: The Delirians "Move Around" b/w "Overdub" and The Return of Steady Beat Recordings! From the perspective of someone who's been around long enough to see the US ska scene rise and fall a couple of times, it's fantastic to witness the return of Luis P. Correa's crucial Steady Beat Recordings. Throughout the 90s, Steady Beat was a key booster of the Southern California ska scene (particularly Latin ska and ska-jazz acts), first releasing three Blackpool cassette comps (which featured live cuts from King Willy, Israelites, Orange Street, Ye Olde English, Mobtown, Soulfuls, Buck-o-Nine, See Spot, The Dynamics, Checkmate, Los Hooligans, Mento Buru, and Mealticket) and two Blackpool 7" singles; then the killer SKAuthentic CD (with See Spot, Mobtown, The Dynamics, Los Hooligans, Let's Go Bowling, Yeska, Joey Altruda, Mento Buru, King Willy, Ocean 11, Hepcat, Checkmate, Unsteady, and Israelites); and ultimately singles and/or CDs from See Spot, The Allentons, Yeska, Mobtown, and Ocean 11. In fact, Luis was so plugged into the scene that back when I was at Moon Records and Buck and I were talking about putting together California Ska-quake, Volume 2: The Aftershock, we tapped Luis to executive produce it--and it turned out to be a phenomenally good release. Yet, despite its high-quality and Moon's promotional efforts, California Ska-quake, Vol. 2 never sold well, which left us somewhat baffled. But considering the fiercely competitive times--1996, at the height of the feeding-frenzy of the ska boom--we chalked it up to West Coast parochialism: we were seen as outsiders trespassing on the LA/Bay Area ska scene turf. However, when you consider how much Moon had done much to spotlight the Cali scene in the early 90s with seminal releases from Dance Hall Crashers (1991), Let's Go Bowling (1991), and Hepcat (1993), as well as the first California Ska-quake (released in 1992 and featuring tracks from DHC, LGB, No Doubt, Jump with Joey, The Skeletones, Crucial DBC, Skankin' Pickle, Hepcat, The Specs, and more), this bias against Moon seemed kind of ludicrous. The label's intentions were good and pure (at heart, Buck is a socialist and was always trying to work collaboratively with other bands and labels so that all ska boats would rise together), but that's just sometimes how things go in the music business. 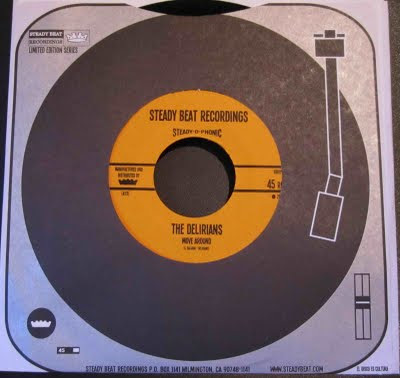 The resurrected Steady Beat has recently issued two new limited-edition 7" vinyl singles from Mexico's early reggae crew Jamaica 69 (to be reviewed shortly) and LA's superb ska/rocksteady group The Delirians (who backed Queen P on the Echoes of Kingston tour). The Delirians' vintage ska sounds mighty good on "Move Around" (love the tinkly piano riffs! ), with lyrics that (unsurprisingly) exhort one to dance: "Oh, make your move/Take your groove/Yes, we're gonna let you do your thing/Don't be afraid/or have no shame/Yeah, we'll have our fun anyway/So do The Chicken/The Mash Potato/Yeah, The Twist and The Alligator/Don't be afraid/or have no shame/Who are they to judge, anyway?" If these unrelentingly bouncy ska rhythms don't compel you to dance, you're six feet under. "Overdub," despite its title, is not a dub cut, but rather an upbeat organ-driven instrumental that's got to be a dance floor stormer live. Thanks to John at Hoi Polloi Skazine for sending the dancing thermometer artwork (adapted from the Pork Pie version of New York Fever)! Also, Megalith recently announced that they now have the expanded CD re-issue of 2Tone Army (AKA Hard Band for Dead) in stock to go along with the LP version that Jump Up Records just issued. 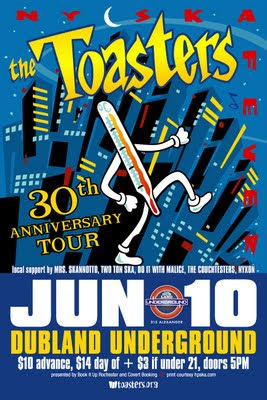 Lastly, there is a Facebook "discussion" about which classic Toasters song the band should cover on their next album. Let your wish be known here. My votes are for "New York Fever," "Ploughshares into Guns," "One Track Mind," or "Ska Killers." Preview of King Hammond's New "Showbiz" Album! Here's the preview video for the tracks on King Hammond's new album Showbiz, which will come out in mid-June (and features a cover illustration by Steve Friel, who is probably best known to ska fans for his work for Unicorn Records and George Marshall's "Zoot"). Pre-order it now directly from the King! Who is Queen P of Ocean 11? There's an interesting feature in the Stockton, CA Record on Queen P (AKA Persephone Laird) of Ocean 11, who is currently on the Echoes of Kingston tour, backed by The Delirians. To check up on the progress of the Echoes of Kingston tour, go here to read the tour diary, see pix, etc. 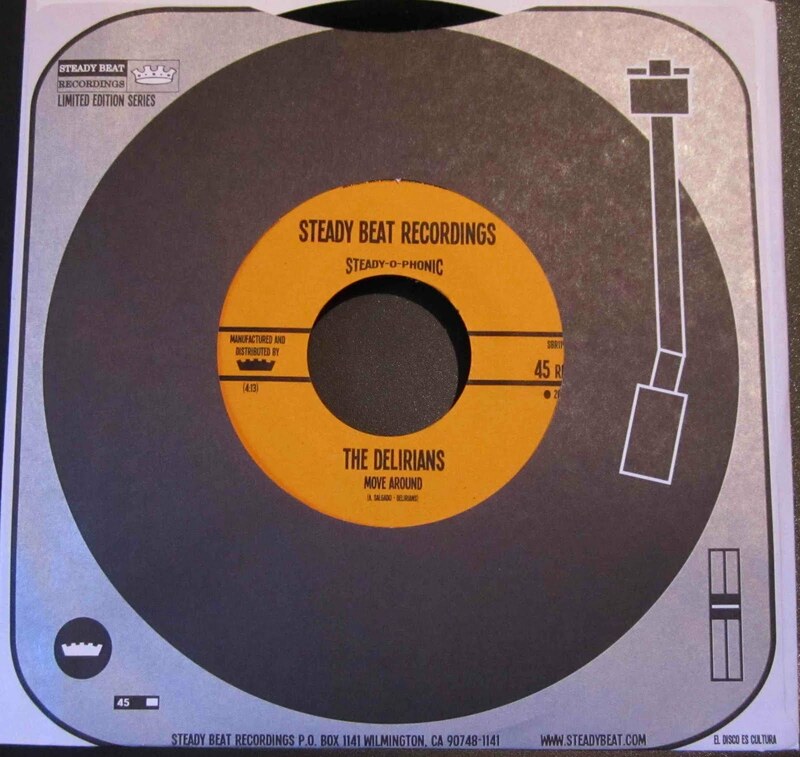 Also, look for a Duff Guide to Ska review of the new Delirians 7" single (on Steady Beat Recordings) shortly! For more info, click on www.hatcitykitchen.com or the official Facebook invite. Bigger Thomas hit the stage at 10:00 pm! 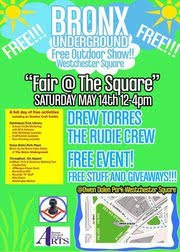 Thursday, May 19, 2011: NYC Champion Reggae! Plus, if you are looking for something to do earlier that night, head over to the Motor City Bar (127 Ludlow Street between Rivington and Delancey) to enjoy the reggae wax spun by Hahn Solo (Dave Hahn of Dub is a Weapon) and President Carter (DJ Carter Van Pelt, WKCR-FM). They'll be playing the best in roots, rock, reggae from 6:30 until 10:00 pm (and it's free). 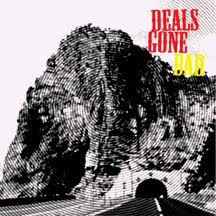 Duff Review: Deal's Gone Bad "Far from Home" b/w "These Arms of Mine"
Chicago's rocksteady-soul outfit Deal's Gone Bad are back with their first new release since The Ramblers (Jump Up Records, 2007)--the slamming new Treasure Isle-goes-Motown single "Far from Home." I haven't heard a cut this inspiring--dare I say joyful--in some time. Your situation's got you lower than low? Crank this baby up on the old dansette (or iPod) and you'll find the inner strength to go on to fight another day. As you might infer, "Far from Home" is about surviving your life's journey--figuring out how to persevere and overcome all the adversity that might befall you while you're out there on your own. Todd Hembrook sings, "You can go underneath the mountain/but don't you cross the center line/and there are other paths, so far/but beware the short way down/and don't you ever fall behind!" (or else evil, time, or your mistakes will overtake you, no doubt). Despite the myriad challenges, you should never despair, since "the Father is watching from right around the bend/you're half way home!" The flip side finds the band in Stax territory for a terrifically urgent rocksteady reading of Otis Redding's longing (and in OR's version, almost mournful) "These Arms of Mine." Quick--somebody give Todd a hug before he bursts! "Far from Home" will be released on May 24, 2011. The 7" vinyl single will be available through the band or via Interpunk mail order. The vinyl single is limited to 500 copies-so grab yours fast! In addition, digital downloads can be purchased through iTunes. 2012 London International Ska Fest Dates Announced! Sean Flowerdew has just announced that the 2012 London International Ska Festival will be held from May 3 through 6 with 30+ bands and DJs from all over the world! Many more details to be announced later on in the year...but you can buy your discounted early bird tickets here. "The Rhythmic Innovation of Lloyd Knibb"
Virtuoso Skatalites drummer Lloyd Knibb died on May 12 at his home in Harbour View, St Andrew. Knibb was simply the most important and influential modern drummer this country has produced. A master percussionist, he contributed to every style of this nation's popular and not so popular musical forms, including jazz, mento, burru, nyabinghi, rock steady and, by extension, reggae. As a drummer, he established rhythmic syntax through bold innovative advances; a synthesis of styles that set the rules for rhythmic structure that later informed every drummer (interested in Jamaican beats) in terms of the logic and structure of popular dance-floor rhythms. Because of that, he was known as the world's greatest ska drummer. Lloyd Knibb, the veteran drummer who was a founding member of the Skatalites, died on Thursday evening at his family home in Kingston. He was 80. Knibb, who succumbed to cancer of the liver, died in the company of friends and loved ones in keeping with his final wish. According to a well-informed source, Knibb — after being told by doctors in Boston, USA that he had three days to live — asked to be flown home to Jamaica. He arrived in the island at midnight on Wednesday. With his passing, only two of the original instrumentalists of the legendary musical aggregation that started approximately 50 years ago are now left alive. They are bassist Lloyd Brivette and alto saxophonist Lester Sterling. Our condolences go out to the Knibb family and The Skatalites. 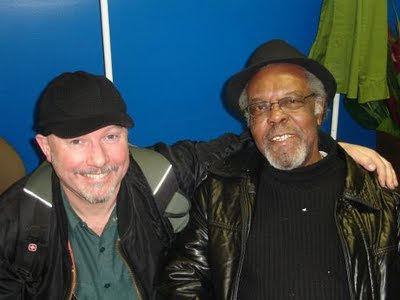 Reggae DJ and writer Carter Van Pelt and Dan Batman conducted this amazing interview with Lloyd Knibb back in 1998. This is required reading for anyone who wants to know more about this seminal ska musician and his contribution to Jamaican music. New RiceRokit Video: "Strawberries and Cream"! While RiceRockit--which made one of the best ska albums of the 2000s, the cinematically-inclined Hang Loose--has largely moved beyond its ska-rock-reggae sound into electro-pop and New Wave territory, I swear I still hear a blue beat sensibility in their new material. Case in point, check out the fantastic video for the new RiceRokit cut "Strawberries and Cream" (inspired from a quote in one of my favorite movies from my teenage years, "Fast Times at Ridgemont High"). Kendo sure do love him some movies, don't he? 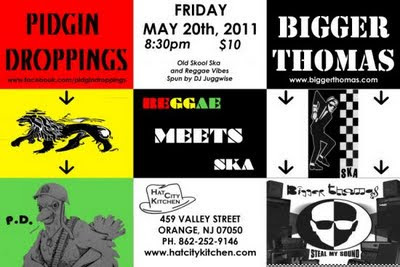 NJ Ska Gig Alert: King Django, The Defending Champions, and The Miasmics Saturday Nite (5/14/11)! New Jersey Ska and Reggae! Door is $7--$2 of each admission is being donated towards breast cancer research! This is The Miasmic's last reunion show (if you didn't know, out of its ashes emerged The Defending Champions...). Echoes of Kingston Tour Hits Cali with Queen P, The Delirians, The Forthrights, and Maddie Ruthless! 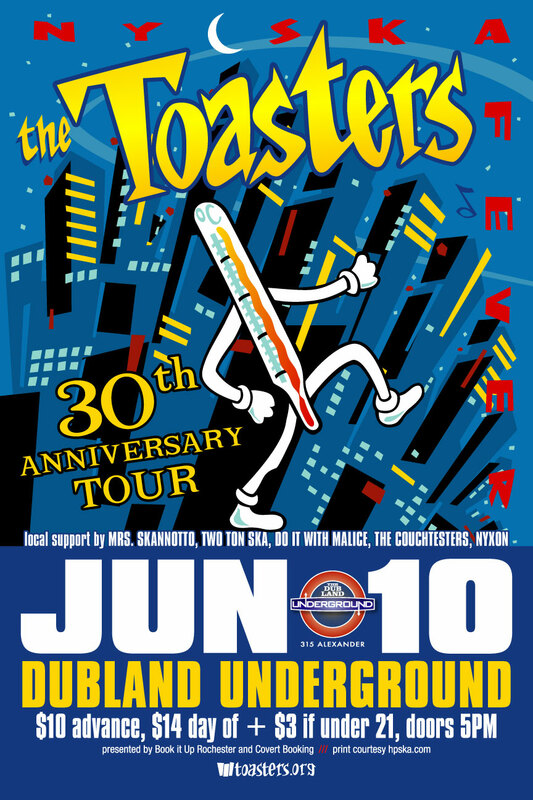 I can tell you right now that there are a lot of jealous ska fans (myself included) beyond reasonable driving distance of Southern California and/or the Bay Area. Why, you ask? Because we're missing out on a brilliant ska/rocksteady/early reggae tour! 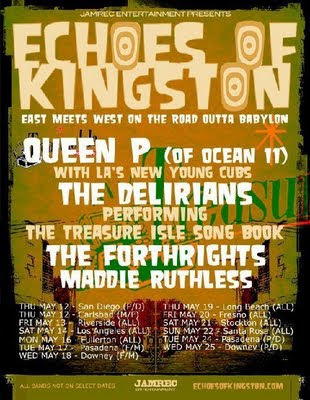 Jason Lawless (Lawless Street blog, Reggae 69 Fan Club, Jamrec Entertainment) has put together a superb tour package--Echoes of Kingston--that features Queen P (of Ocean 11), The Delirians, The Forthrights, and Maddie Ruthless--and includes Let's Go Bowling's 25th anniversary show! If you are anywhere near the gigs listed below, make it a point to get off yer duff and see these amazing bands in action. Support live ska and reggae music (and buy their releases and merch while you're there)! Persephone Laird AKA Queen P needs no introduction to most fans of ska and reggae from Los Angeles. Having begin with the masters of the sound Ocean 11 and never looking back, Queen P personifies the likes of her musical godmothers including Marcia Griffiths and Phyllis Dillon. She will be singing hits from the Treasure Isle song book, backed by The Delirians on select dates of the tour. The Delirians are the newest young cubs to burst out of the East Los Angeles music scene. Raised on the toughest streets of Los Angeles the band have found protection in the form of music from JA to UK. They strive to thrive in a musical landscape forgotten by time. Ready to roar like lions these cats lay down the wicked sounds inspired by the likes of The Skatalites, The Hippy Boys and The Pioneers all rolled into one. The Forthrights are a four-piece group from Brooklyn, NY. Featuring former members of The Pinstripes and The Fad, they take a fresh take on the sound of traditional rocksteady and ska. In a few short years they have solidified their place in the New York reggae scene and have collaborated with Vic Ruggerio (The Slackers), Chris Murray, Mr. T-Bone and King Django. Maddie Ruthless is a 22 year-old musician/DJ from New Orleans Louisiana making art that provides clear connections between New Orleans and Caribbean culture, specifically Jamaica. 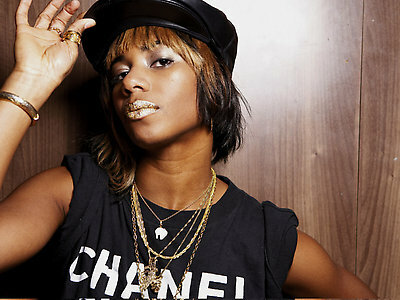 She will be performing her hitsound of tunes backed by The Forthrights on the tour. Santogold and the Beastie Boys: "Don't Play No Game That I Can't Win"
Just have to call to attention my current obsession with the incredibly hypnotic new Santogold/Beastie Boys reggae collaboration "Don't Play No Game That I Can't Win"--off their Hot Sauce Committee Part Two. (They really should consider releasing this as a vinyl single--it more than deserves the high profile treatment.) Gotta love the Lee "Scratch" Perry-referencing dubby sax blast that heralds the start of the track (the Beasties are big Perry fans----I have an old copy of their "Grand Royal Magazine" that contains an extensive article covering Perry's extraordinary career and rating many of the releases from his mega-deep back catalogue). And Santogold (AKA Santi White) has one hell of a sultry alto voice that's perfectly designed for reggae and blows me away. "Don't Play No Game..." also has one of the best rhymes for our times: "You work hard to climb the list/20 years of schooling and they put you on the day shift." Here's hoping that the Beasties and Santogold team up for more version excursions...would it be too much to ask for an album's worth? Not sure how many ska fans out there are aware of Santogold's amazing work with producer Diplo on Top Ranking Santo Gold a Diplo Dub, which came out a few years ago. 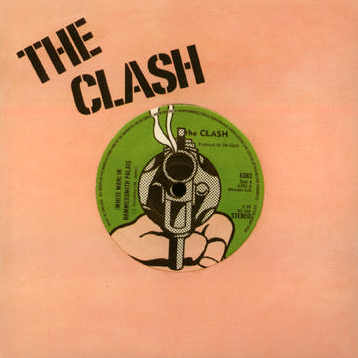 But this crazy mash-up mix tape of sorts has a lot to like on it (ska, skinhead reggae, roots reggae, and dancehall, amongst other genres), including a stunning cover of The Clash's "Guns of Brixton" (retitled here as "Guns of Brooklyn"). It doesn't get much more heartland USA than Omaha, Nebraska (at least in the mind of this big city, East Coaster)--but even there, Jamaican ska is alive and thriving in The Bishops. With their Skatalites-influenced trad ska sound and evocative original songs, The Bishops fall within The Scofflaws, Skavoovie and the Epitones, and Easy Big Fella spectrum of ska music. The Bishops' self-titled, six-track EP kicks off with the stately and fantastically named instrumental "Louis Farrakhan," followed by the sweet "Front Porch"--which transports the listener to a simpler, "Andy Griffith" era (you can picture the lemonade glasses in their hands as they sit on the porch swing, dad surreptitiously keeping an eye on things from inside), as the singer courts his girl, boldly declaring, "I wanna be your man." You can hear the something like heartache in the horns as the band looks in the rear view mirror on "Goodbye Bourbon Street." But they're not swearing off booze, as The Bishops celebrate their preferred drink of choice in "Black and Tan": "We've got a favorite concoction/that leads to intoxication..." (and I love how the slightly slurred horn lines suggest the gradual dulling of the senses with every gulp). "Gilbert Gottfried" suits its namesake well, incorporating occasionally dissonant notes in tribute to the grating former Aflac spokesman. 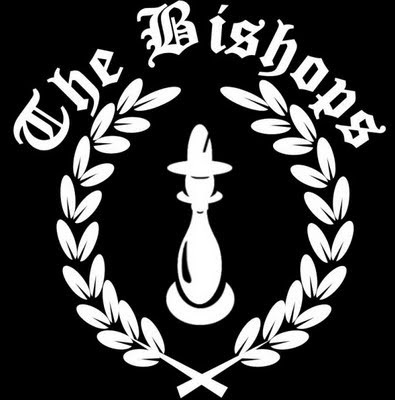 The Bishops top off things with "Mr. Egotistical"--a Roddy Radiation-like rockabilly guitar-driven instrumental that one could imagine being written by one of the bands in the 2 Tone fold. All and all, this is a terrific debut from a band to keep on your radar. New King Hammond Video: "Where Have All the Rude Boys Gone?" King Hammond is previewing another superb track from his forthcoming Showbiz album. The video for the great 80s-inspired "Where Have All the Rude Boys Gone?" is below. Gotta love how the "Stay rude, stay rebel" refrain echoes the sentiments of a great track of the same name from early 90s German ska band No Sports! Buster may be asking this question himself. These are photos from last Friday night's Bad Manners show in Buffalo sent in by John from Hoi Polloi Skazine, who drove from Rochester to see Fatty. (Buster looks great and trim in his leopard-print suit!) According to John, despite the poor turnout, Bad Manners put on a great show. 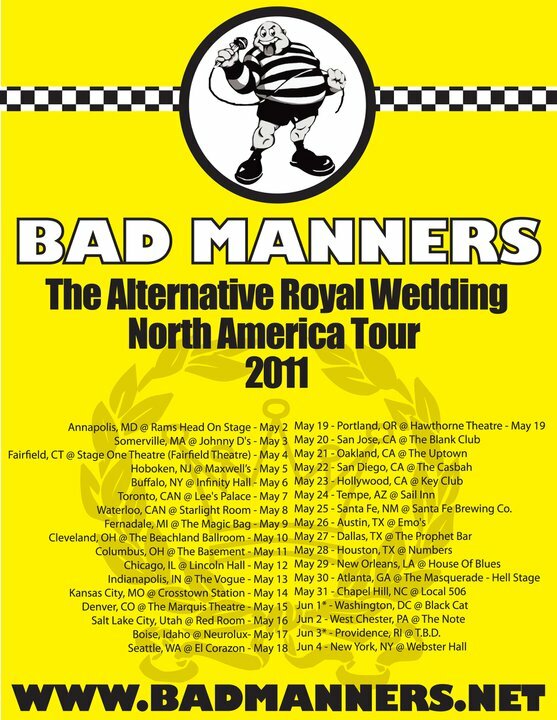 Can't speak for the rest of the country, but surely the Bad Manners NYC date on June 4 at Webster Hall will be better attended (already know a bunch of people who are going, including yours truly...). NYC Ska Gig Alert: The Rudie Crew and Excuse Me Tonite! To help raise donations for the family of Mitch Dubey--a slain friend and fellow musician who was in The Flaming Tsunamis--The Forthrights have donated a special Camp Birdman package (all 3 colors of this 7" EP plus one test pressing--only four were ever made--AND a Forthrights t-shirt, poster, and stickers) that is being auctioned on eBay (to bid, go here). Right now, there are about five days left in the auction, with 20 bids so far. Dubey was shot and killed in an apparent home invasion robbery in March. To find out more about this beloved musician and the senseless event that ended his life, go here. 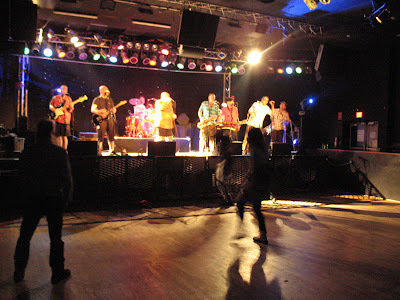 While I was bummed that I wasn't able to attend the 2011 London International Ska Festival (for a whole host of reasons), I am really happy to be able to include this review from an American ska fan who made the journey. 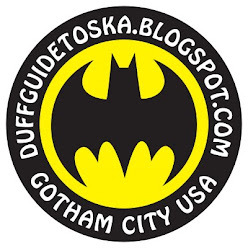 NYC ska fan Andrew Rundle, a regular Duff Guide to Ska reader, was kind enough to write up his impressions of the festival and share them via this blog. All in all, the London International Ska Festival was a huge success--hats off to the organizers. For me the high point was The Trojans’ performance during which they brought out Rico to lead the band for about two-thirds of their set (see them all in action above), and had Lynval [Golding of The Specials] out singing and dancing for part of the set. Another personal high point was seeing Bim Skala Bim performing again; the last time was as one of the opening acts for The Bosstones’ Hometown Throwdown. The announcement that Bim was going to be on the bill basically sealed the deal that I was going to fly to London for the festival. For the audience in general, I think Dave Wakeling’s version of The English Beat was the most eagerly anticipated act--in the pubs around the venue the buzz was all about Dave. He performed a killer set, much better than recent outings in New York City, and stuck to The English Beat material rather than doing The English Beat/General Public mash-up I have seen several times in the US. He also had Rhoda Dakar and Jennie Bellestar as backup singers and my only critique of the set would be that they were under-utilized. It was also a thrill to see Ken Boothe, whom--up until the Festival was announced--I had given up hopes on seeing; great voice, great performance. Probably the weakest act at the festival was Dave and Ansel Collins backed by The Caroloregians. It took them several songs to get in sync, with all Caroloregian eyes focused on Ansel, who sort of conducted the band. There also seemed to be some tension as to when Dave was actually going to take the stage--"Monkey Man" came and went before the vocalist actually appeared. It didn’t help that they were preceded by The Hotknives and The Loafers, who had both reformed for the show and turned in excellent sets to large fan bases. In many ways Friday night peaked with The Loafers. James Hunter on Thursday gave a strong performance, but his soul sound seemed like an odd choice for the festival. One hiccup was a misprint in the show schedule, which, combined with my decision to see the Chelsea game, caused me to miss The Amphetameanies. The Clapham Grand is an old theater/dance hall with great sound and sight lines--and handy proximity to several pubs, a Cornish pastie store, and a kebab shop claiming to have “probably the best kebabs in London.” The crowd was there to dance and enjoy the music; there was one minor scuffle on the dance floor that was quickly shut down by the staff. A large portion of the audience had clearly been fans of skinhead reggae and 2 Tone back in the day when they were teens. Usually in NYC, I am one of the older people in the crowd, but at the Clapham Grand I was on the younger side of the age spectrum. It was cool to meet fans from across the world and hear about various ska scenes--people were there from Japan, the US, Australia, and South America. 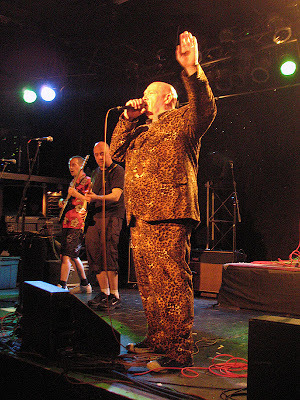 Also on Thursday night, Buster Bloodvessel was in the audience enjoying the music and dispensing hugs to fans. I hope the festival proved to be as big a success for the organizers as it was for the audience. I would love to see this become a continuing festival. Thanks, again, to Andrew for the LISF report! If they haven't ever been on your radar, you should know that Maroon Town's genesis was in the late 80s UK ska scene that spawned the likes of The Trojans, Potato 5, and The Loafers--and rejuvenated the careers of Bad Manners and Laurel Aitken. What made Maroon Town unique was their mix of vintage ska, reggae, hip hop and soul (with socially conscious lyrics often from the perspective of the common person), as exemplified on 80s/90s hits like the cover of Prince Buster's "City Riot," "Pound to the Dollar," "Prince of Peace," and "Average Man" (several of which were produced by The Specials' John Bradbury). While Maroon Town (the core of which is Deuan German and Rajan Datar) has been active on and off over the past 20 years--often collaborating with a rotating cast of musicians from all over the globe--Urban Myths is their first album since 1997's Don Drummond. And even though about half of the songs on this album are new versions of old songs or have previously appeared on other Maroon Town records, this is still a powerful and compelling return to action. On Urban Myths, Maroon Town successfully ventures into such non-ska genres as salsa ("Latin Moshpit"), jazz (a groovy reading of Herbie Hancock's perennial "Watermelon Man," which appeared on New Dimensions), and soul ("Innocent Mind" and "Clarendon Calling," with the fantastic Jenny Stanford on vocals; both of these songs appeared in different versions on Don Drummond)--but it's the ska and reggae tracks that play to the band's greatest strengths and catch them at their most appealing. "Ya Ya (Lemme Tell Dem)," with its immensely catchy sing-along chorus, is a hard-driving, raucous ska cut about hitting the town (MC Sirreal toasts, "I got up in the morning and went to the bar/When I came out all I saw was the stars"), acting up, coming on to, and mouthing off to anyone within striking distance. While there's gonna be hell to pay--not to mention one hell of a hangover--the sound and heat generated makes it all worth it. It's then quite a contrast from the yobbish chorus of the ugly 24-hour bender to the lush and polished ska-pop of "Lion" (which even includes the sounds of plucking violin strings), though its sheen can't mask the something's-gotta-give desperation (and, ultimately, the hope) in its lyrics. Andrew Tumi sings, "I'm tired of feeling gray/How I pray it'll go away/Saving happiness for rainy days/One life and the price you'll pay/Can't keep it up this way/My deep heart's in a shallow grave/Once it's full, it's all you got/Cause something's not right and I gotta move on...I want to run like a lion in the sun..."
You'll long for a lyrics sheet when you hear "Wreckless"--the pace of the rapping by The Wreckless Crew is so freakin' frenetic and urgent that you can barely make out every other word (it still sounds great, though). "Bella Cosa" ("beautiful thing") is Latin-tinged roots reggae with excellent LKJ-like toasting by Rubi Dan; the encouraging chorus urges us to hang on and "realize, realize/hope is just a shot away." "Bullit," perhaps inspired by the Steve McQueen film of the same name (which is actually spelled "Bullitt") is an crisp Skatalites-flavored instrumental (though it's considerably less revved up than that film's car chase through the streets of San Francisco). The seductive "Are You Ready" (which also appeared on the Don Drummond album) wants to lure the listener on a mystical musical journey. The superb Mikey Roots toasts: "All generation love the musical spring/The African man a instruct you again/In a traditional style for real a god send/Vibes to conquer duppy vibes to make us boom beng/Rootical flavor well and nice and ting/Crowd a people just a bubble crowd a people just a sing/No say them love the old school feeling/Cause the people bawl yes every time a sing a sing/Are you ready?/Tell me are you ready?/Are you ready?/Then follow me now!" After hearing this, there won't be any question in your mind about what you're gonna do. 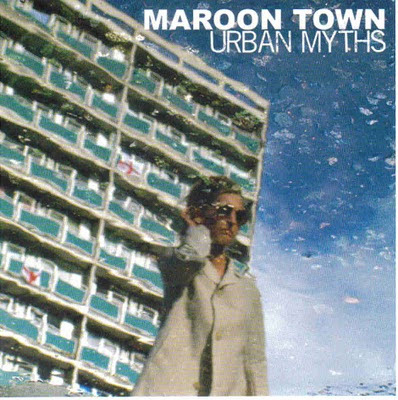 Die hard Maroon Towners may be a bit put off that there's only an EP's worth of new material on Urban Myths after so long a wait, but the new stuff is stellar--and the album serves as a terrific primer on the band for newcomers. New Selecter (Pauline & Gaps) Singles, Video, and Album! The Pauline Black and Gaps Hendrickson version of The Selecter is back in full effect and sounding mighty, mighty sweet! Their brand new anti-fascist single "Big in the Body - Small in the Mind" (a preview video is below) will be released on May 30, 2011, followed by the wonderfully titled "Back To Black" track on July 30. For vinyl freaks like me, there will be a limited edition 7" double-A sided vinyl single issued with both tracks that will be available beginning July 23, 2011. All of this, of course, is leading up to a new 10-track Selecter album titled Made In Britain, which "explores the multicultural landscape of today's Britain and beyond." Made in Britain will hit the shops on September 1, 2011 via download and limited edition 12" vinyl. We can't wait to hear it (and we're hoping that a US tour--or at least a NYC gig--is in the works)! 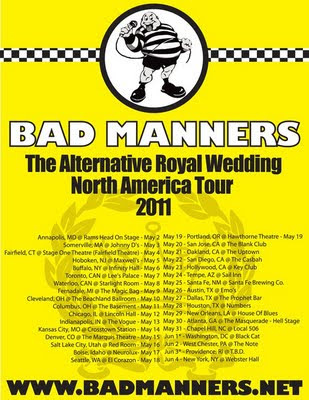 Where the Fatty Meets the Road: Bad Manners May Tour of the USA! I've been very busy with work lately--and on the ska front seem to be wrestling with a bit of writer's block (the process of reviewing Maroon Town's Urban Myths has been agonizingly slow). So, we're going to take a break from ska reviews/news to look at some videos I came across earlier today when on a break. "White Man in Hammersmith Palais" is probably one of my favorite Clash tunes (by the Only Band That Matters), partially because it helped serve as sort of a gateway drug to ska and reggae (and I've been hooked ever since...insert groan at the second cliched druggie reference)--and in how it recounts Joe Strummer's real-life experience of going to a reggae showcase (featuring Dillinger, Leroy Smart, and Delroy Wilson) with Don Letts and being kind of an outsider--one of the few white people there--but not be bothered about it. He was there for the music. Nothing else mattered. In different stages of my life, I've been able to relate to this pursuing of one's love of music despite being different from the larger fan base (in high school, I went to several hip hop and reggae shows where I was one of the few white faces; in college and soon after, I went to ska gigs where mine was one of the few non-shaved heads; now, I'm one of a handful of hopefully-not-creepy-middle-aged guys still going to ska shows with fellow fans young enough for me to have fathered). What am I doing in these sometimes uncomfortable situations? Just like Mr. Mellor, I'm only lookin' for fun. Below are two different versions of "White Man" separated by almost 20 years. I never caught Joe when he played with the Mescaleros (not sure why...some of those years were rough, wilderness ones for me...and the Mescaleros material never really connected, probably because I simply wanted more Clash than he could give). I really regret that I never got around to it. I've never seen this mind-blowing live video of their cover of Willie William's "Armagideon Time" (which segues into the dub "Justice Tonight"). Not many punk or new wave bands could ever hope to play reggae this well--and Topper Headon's drumming is nothing short of extraordinary. This gives me freakin' chills, it's so perfect.